Pierre Sommereijns, CEO of GRP pipe producer Amiblu, talks about future challenges and renovation options for pipe networks. Why is the European water network in dire need of rehabilitation? Sommereijns: European cities are full of history. By that I mean that they are old – just like the water networks supporting them. Back when they were built, they didn’t have materials like GRP that last for 150 years. Even if they structurally hold up, around 23 % of drinking water is on average lost every year in Europe because of leaking networks. 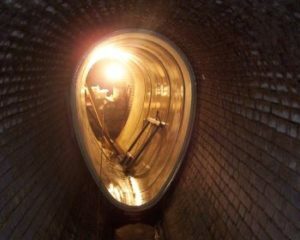 The sewer network of Europe has a length of 3,000,000 kilometres – a length that, even with the most sophisticated assessment equipment, is tough to monitor and maintain. Modern pipe materials with smart monitoring options need to be the future. And on top of that, rainfall is becoming increasingly heavy. In combination with impervious surfaces such as roofs and asphalted roads, flooding and overloaded wastewater treatment plants are the consequence. What are the options to renew pipelines and prevent failures? Sommereijns: It depends on the structural condition of the existing network – and that is also the problem. It’s extremely tough to assess whether a channel is still structurally sound or not. Therefore, many operators and engineers opt for a structural long-term solution that not only rehabilitates the inside of the pipeline but also the outside. You can, for example, insert pre-made elements into the old pipeline and renew the channel with a method called sliplining. Or you can insert a resin-saturated tube into the old channel and cure the resin using hot water, steam or UV light. This method is called cured-in-place pipe or CIPP and is mainly used for smaller diameters. Sliplining with prefabricated profiles is the way to go for bigger diameters, as you can control the curing and this option is also very flexible regarding the shape of the new pipeline. Which solutions does Amiblu provide in terms of rehab? Sommereijns: With our technologies Flowtite and Hobas, we have produced circular and highly unconventional non-circular (NC) pipes to renew old channels. The GRP elements are tailor-made for the old pipeline in diameters up to 4m and can easily be joined without welding. Once the old channel is lined with the circular or NC profiles, the space between old and the new channel is grouted and you get a completely new pipeline. Even though the diameter is slightly smaller, Amiblu pipes have a mirror-like inner surface that allows for more water to flow through. Which innovations can we expect in the rehab sector? Sommereijns: We offer special products that particularly serve cities with combined sewer systems. Our Combined Sewer Overflow chamber and our Amiscreen are two systems that filter pollutants from storm- and wastewater during severe weather events. The Amiscreen system can also be integrated into stormwater overflow basins of other materials like concrete, both in new constructions and as subsequent upgrade. Find out more here: http://bit.ly/SOB_Amiscreen – and feel free to put us to the test anytime!